The recent trend in newer computer peripheral and other devices is that, devices are getting more and more multi-functional. Back at CES 2011 LG electronics unveiled to the world its first prototype of the LSM-100 scanner mouse. LG is now all set to open a new era for scanners at this year’s IFA 2011 with the LSM-100, the mouse with a built-in scanner. The problem with conventional scanners is that they take up a lot of space on the desk and can only scan papers of a limited sizes. Using the LSM-100 is far more convenient, all the person has to do to take a scan is to hold the scan button placed at the left side of the mouse and move it in a regular pattern from top to bottom. The scanned image can then be saved in a wide range of formats i.e. PNG, JPEG, TIFF, BMP, PDF, XLS and DOC or it can be simply dragged and dropped into the desired application. 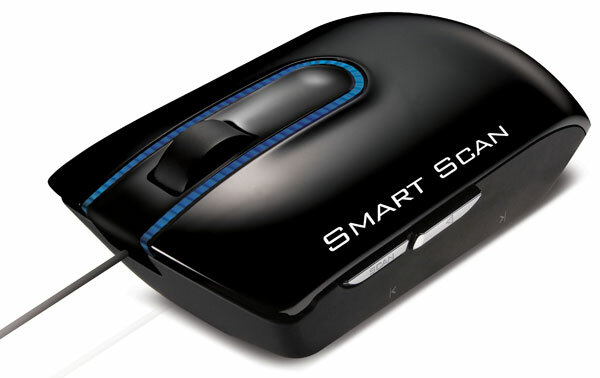 Its makes scanning a simple process, it has been incorporated with newer scanning technology which makes it faster. The most intersting part which a lot of people would love about this device is the fact that it has LG’s Optical Character Recognition technology, this converts scanned text into a Microsoft Word document that can then be easily edited and manipulated. This give you the make changes eliminating the need to retype text from printed media onto the screen thus saving a great deal of time. The mouse can easily scan upto A3 size sheet (297mm x 420mm). Ultimately its also a top of the line mouse with accurate laser sensor with a durable, and the stylish design. Although its said that the product is scheduled for release in September in North America, Europe and the major foreign markets. I found that its already on sale at Amazon check it out for $120. If you really have the money for it, its worth buying.